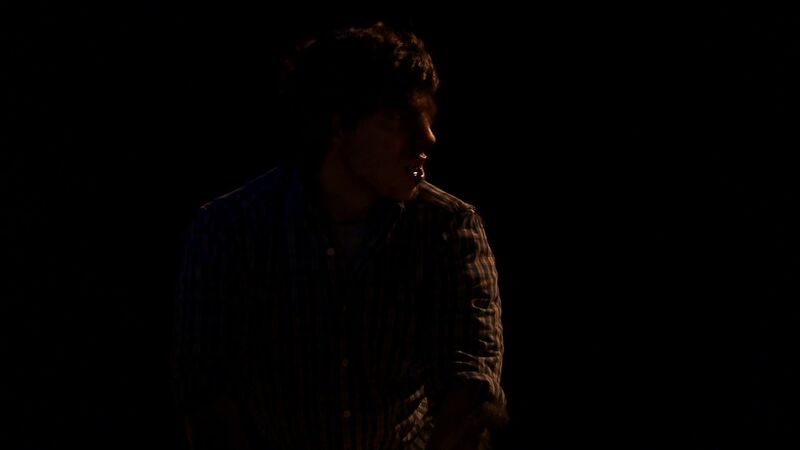 The Lone Wolf is Jacob Coburn’s senior cinema studies thesis film. The main character is a young college student named Alan. He is not particularly impressive or manly in any way, but there does not seem to be anything wrong with him either. He has a pretty girlfriend named Lily, but he is quiet and very insecure, especially about their relationship. Lily is good friends with Todd, an outgoing and athletic classmate. Alan is extremely jealous of their friendship to the point of paranoia. The film follows Alan as his jealousy and paranoia grow, and he has an increasingly violent recurring dream about a creature attacking Lily and Todd in the woods at night. Throughout the film, Alan has a bandage on his arm, covering a dog bite that is mysteriously slow to heal. 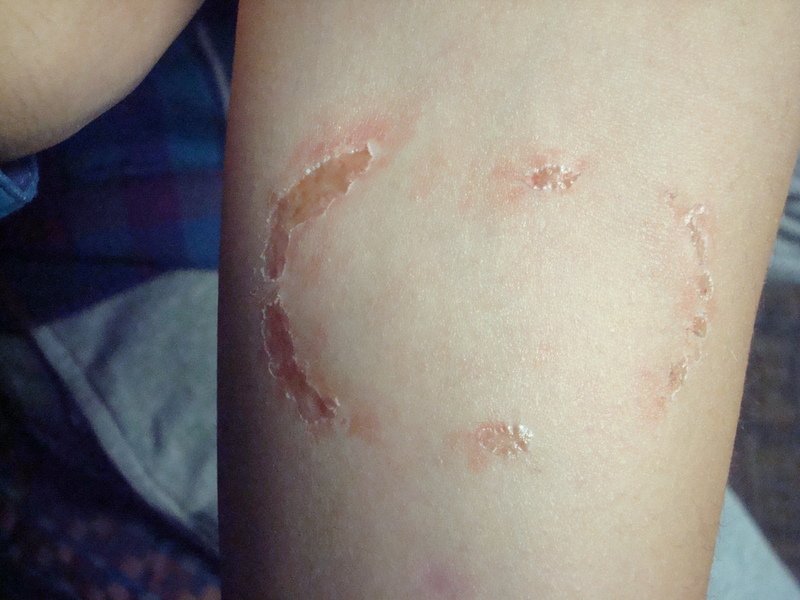 He believes it is actually a werewolf bite and that the creature in his dreams is the werewolf. He tries to talk to Lily about this, but the idea sounds crazy and only makes her feel uncomfortable. As the dreams progress, the interactions between Lily and Todd become more romantic, and the attack they suffer becomes more violent. Alan begins lashing out at Todd in real life, but Todd is the better athlete and Alan is easily beaten. In the final dream, Alan disappears as spectator, and we finally get a clear look at the creature. 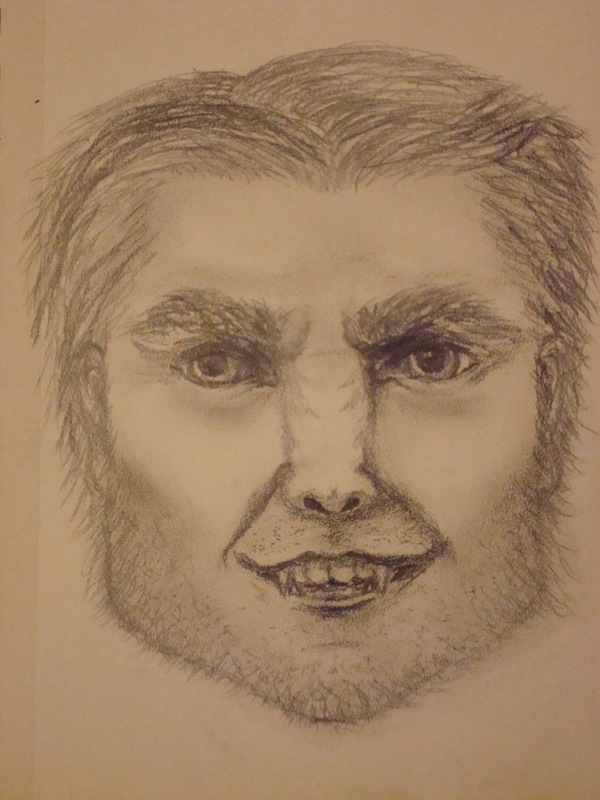 The werewolf is masculine and animalistic, but it is unmistakably Alan. Todd and Lily recognize him just before he bites Todd’s throat with his sharp wolf fangs and slashes Lily’s with his claws. He awakes alone in bed, rips off his bandage, and sees that his bite has healed, leaving only a faint scar. Jake and I spent a lot meetings discussing what he wanted his film to say, what tone he wanted to set, and what the werewolf meant to him. We both agreed that it would be most interesting to focus on the psychological aspects of the piece, using the werewolf as a metaphor for suppressed and unrealized masculinity and violence. His jealousy of Todd brings to the surface his most basic and animalistic tendencies, but the constraints of society and of his body prevent him from fully realizing these inclinations. He is not physically capable of effectively unleashing the full force of the rage he feels on those he perceives as deserving of it, so he plays out these violent fantasies subconsciously, whether he is actually losing power over his body to the animal or merely dreaming about it. The violence is enacted by an uncontrollable and powerful creature within him, not the socialized and educated young man he is to his classmates. This raises the question of violence being excused as “masculine” or “boys being boys.” In order to focus on this problematic repression and excusing of male violence, and to emphasize that the animal is still the man, I wanted to approach the makeup more as an exaggeration of Alan’s masculine features, rather than a transformation of him into something categorically other. It was important that he look wild and dangerous, yet still be recognizable as himself. I did a few sketches to work out how to approach the werewolf design. I knew that I did not want to go with a full face wolf mask, or even to have him necessarily look like a wolf. I decided that one of the most distinctive markers of exaggerated masculinity is strong bone structure. 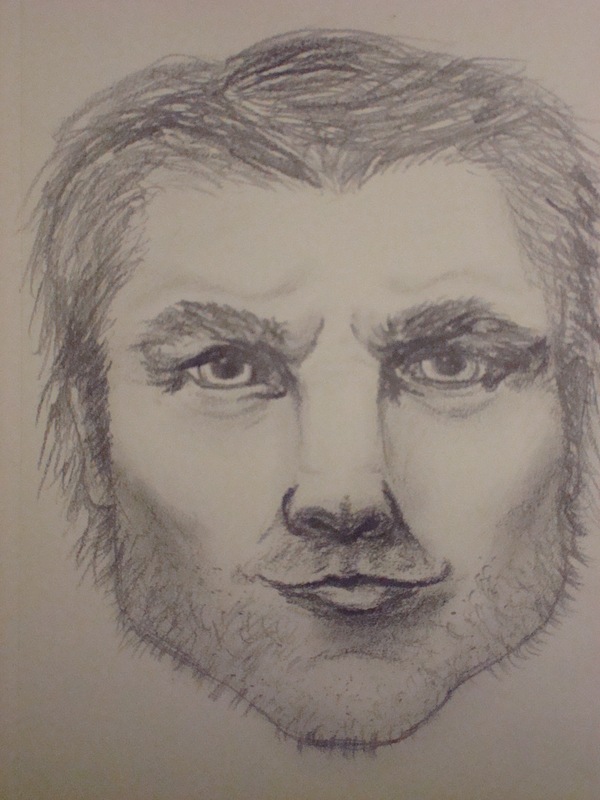 By emphasizing the brow, the cheek bones, and the jaw, and widening the bridge of the nose, I could make the actor look more masculine and animalistic without completely hiding his features. The wide bridge of the nose would also give his face a distinctly canine appearance without having to extend his face into a full wolf muzzle. Thickening and extending the eyebrows, hairline, and facial hair would also serve the purpose of making the actor appear more masculine and canine. Robert, the actor, already has somewhat exaggerated canine teeth, so I decided to emphasize that by making some acrylic tooth caps for him. I would also give him acrylic nails, shaped and painted to look like claws, and add hair to his ears to give them a pointed silhouette. The werewolf scenes were to be shot in the woods and at the edge of the woods at night, so much of the footage would be dark or almost silhouette. Because of this, I had to focus on creating shapes more than colors or even textures. The first step after the design was complete was to do a lifecasting session with Robert. I would need a plaster cast of his face and teeth before I could begin sculpting the facial prosthetics or tooth caps. Robert and Jake came over to my house for the session. First, I did the teeth. I mixed dental alginate with water to form a paste, which is then scraped into a dental tray. I then put the tray in Robert’s mouth, pressed his teeth into it, and waited for it to set (about three minutes). 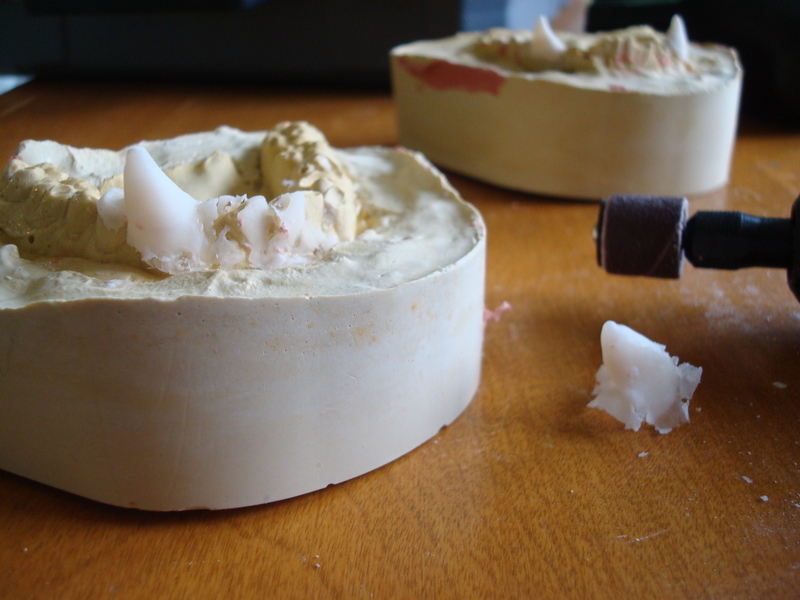 Once the alginate mould was removed, I quickly mixed some labstone to make a cast of the teeth. I could not afford to wait until the lifecasting session was over because alginate begins to degrade after about an hour and waiting can compromise the integrity of the mould. I repeated this process for his lower teeth as well. Once both sets of teeth were cast, I began to prepare for the face cast. I had decided to use alginate for this as well. It is not as true to form or as durable as a silicone mould-making material would be, but for a student film the nicer material was prohibitively more expensive and unnecessary. I prepared Robert’s face, especially his eyelashes, eyebrows, and hairline, with a release cream to ensure that there would not be any difficulty removing the mould. 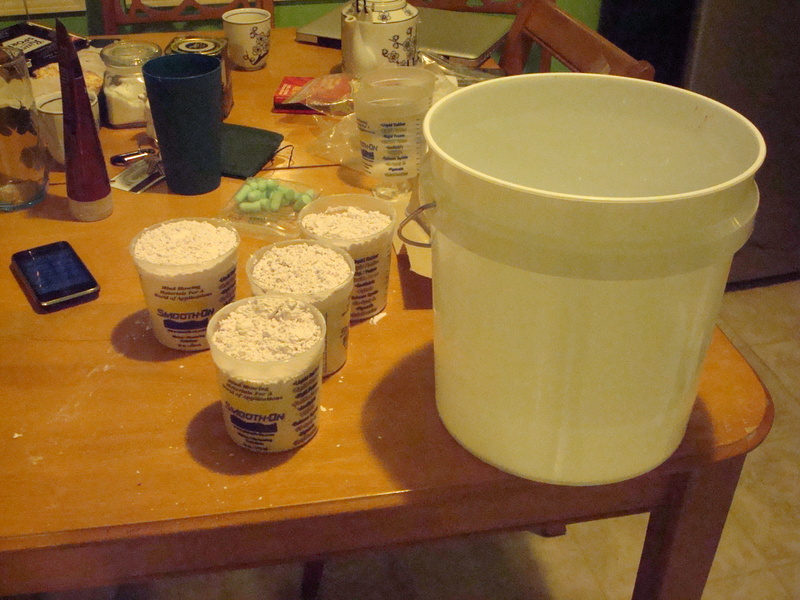 When everything else was ready, I began to mix a large batch of alginate. I used an industrial mixer attachment for my drill to speed up the mix time and ensure even distribution. After mixing, I let the alginate firm up a little until it was at a spreadable consistency, then applied it to Robert’s face, taking care not to cover his nose so as not to impair his breathing. 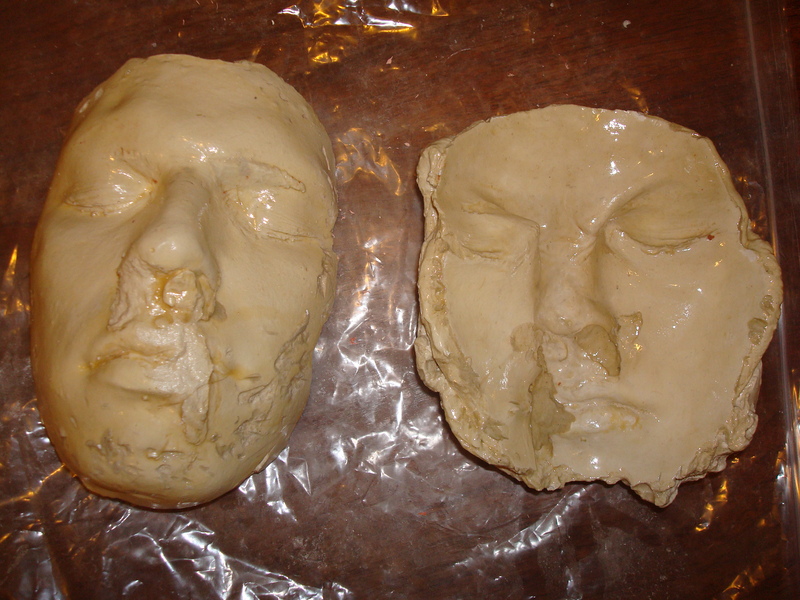 Once the alginate cured, I applied plaster bandages to create a mother-mould to give support to the flexible alginate mould. When the plaster was set, I removed the moulds, helped Robert get any remaining alginate out of his hair, and cast the plaster into the alginate mould. 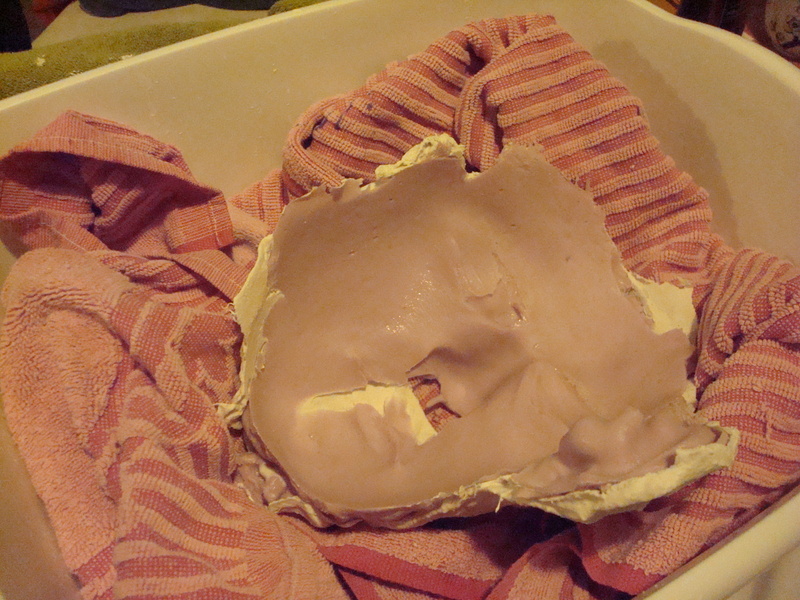 After giving the plaster time to set and sealing it with several layers of shellac, I started sculpting the facial prosthetic. Using plasticine non-sulphur clay (sulphur inhibits the cure of the silicone that I used to make the prosthetics), I sculpted the positive form of the prosthetic onto the positive cast of Robert’s face. The sculpt created a flat plane connecting the bridge of the nose to the forehead, widened the bridge of the nose to be even with the nostrils, exaggerated the brow bones, and furrowed the brows and the bridge of the nose into a scowl. Once the sculpt was finished, I added a layer of petroleum jelly and several coats of release spray to ensure that the second half of the mould would not bind to the first. I then built cardboard walls around the plaster cast, sprayed them with release spray, and poured the plaster negative mould, building it up in progressively thicker layers. When the second mould was set, I carefully pried the two apart, removed the clay, and washed the moulds. I then sealed the negative mould with shellac. 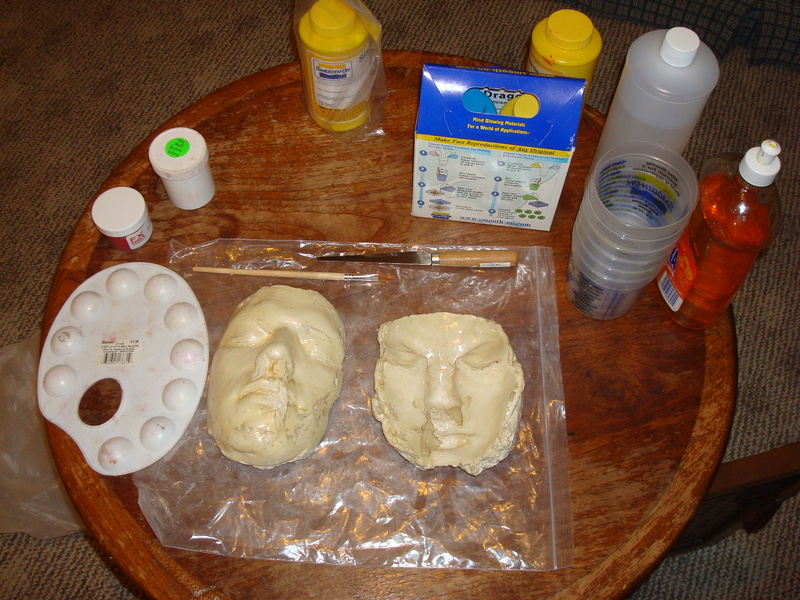 The next step in the process was casting the silicone prosthetics. I decided to make a gel-filled piece, which would move with Robert’s facial movements and react more like real skin than would a fully-cured silicone piece. I painted both halves of the mould with a mix of isopropyl alcohol and dish-soap to ensure that the silicone could be demoulded. 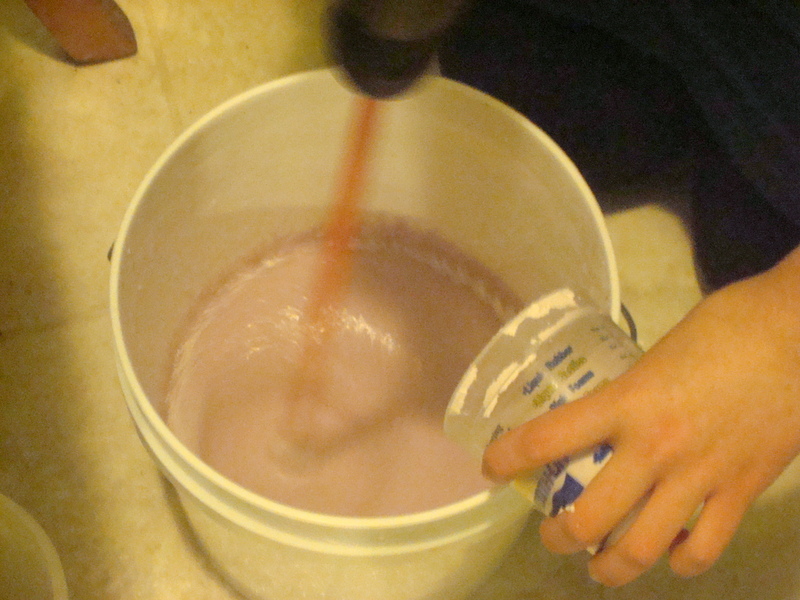 I then mixed a small batch of platinum-cure silicone rubber and added a tiny amount of pigment and red flocking. I used very little pigment because this silicone was to serve as the top layer of skin and the encasement for the gel filling. If it was too opaque, it would be very difficult to make it look realistic, as skin consists of translucent layers through which you can see undertones of flesh and veins. I painted this silicone in a very thin layer onto both halves of the mould, and then sped up the cure time with a hair dryer. Once this layer was set, I mixed a larger batch of silicone: one part silicone, one part catalyst, and three parts slackening agent, plus pigment and red flocking (more than was added to the first batch). The slackening liquid gives the silicone a gel-like consistency and makes it less dense than regular silicone, allowing for more movement. I poured the silicone into the negative mould, starting at the lowest point, then pressed the positive mould into it. This presses out any excess, and leaves what remains in the negative space between the two moulds where the clay had once been. The result is a prosthetic that fits perfectly to the actor’s face and on the front has the shape of the clay sculpt. I allowed the cast to cure for six hours. I pried the mould apart to release the suction and then carefully peeled the silicone piece off of the mould, powdering it so it would not stick to itself. Once it was removed, I trimmed the excess silicone from the eyes, cheeks, and under the nose. Next, I began adding the hair. Adding hair to a prosthetic is a time consuming process that involves punching hair directly into the silicone using tiny hair punching needles. This makes the hair look as if it is growing from the prosthetic, as opposed to having been glued onto it. I would have much preferred to use natural human hair for this part of the process, but due to budgetary and resource restrictions it was necessary to use wool crepe hair. It is not the best product for this project because the color and translucency is not the same as human hair. However, considering the way the scenes with the werewolf were going to be shot, color and translucency would not read as much as texture and shape, so the wool hair would work well on camera. I left the painting of the piece until the application process, so that I could paint the Robert’s face and the prosthetic together and make certain that they blended. The next part of the process was to make the tooth caps. I sculpted the teeth onto the positive casts of Robert’s teeth and made and alginate negative mould of the teeth with the fangs. I mixed dental acrylic and monomer into the fang cavity and pressed the positive cast of the teeth (with the clay removed) into the mould. This created tooth caps in the shape of the sculpt with space for them to fit over Robert’s natural teeth. I shaped and polished the teeth with a rotary tool. 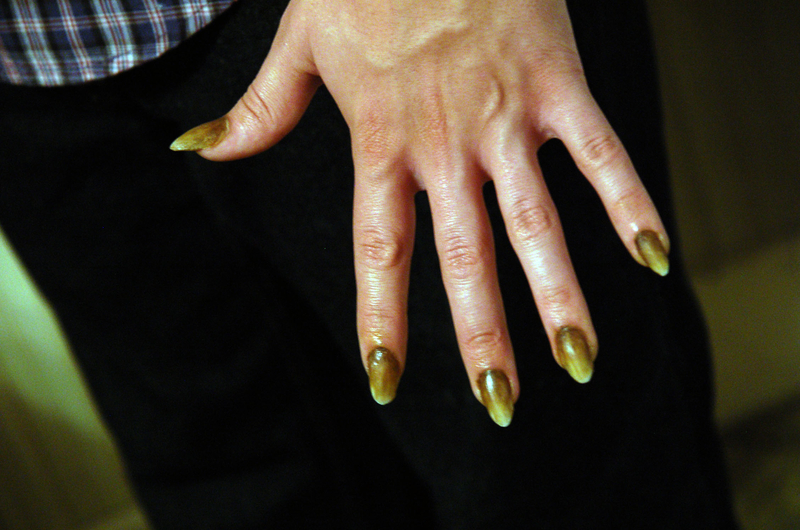 On the day of the werewolf shoot, we decided to break up the makeup into two sessions: one for the acrylic claws I would be making directly onto Robert’s nails (think of an acrylic nail manicure, but werewolf claws instead of french tips), and one for everything else. We met for the nail session around 3pm and finished around 5. I glued nail tips onto Robert’s nails, extending their length and shaping them into pointed claws. I then layered acrylic over his natural nails and the tips to create the nail. I made the acrylic thicker in the middle to give the nails a more curved claw look and, once it set, I filed the top of the acrylic to give it a more rough and ridged texture. Once the shape and texture was finished, I painted the claws with a yellowish tone and a darker shade near the nail bed to make them look more like the claws of a creature who had been running through the woods. We took a break for dinner and reconvened for the rest of the makeup around 7pm. 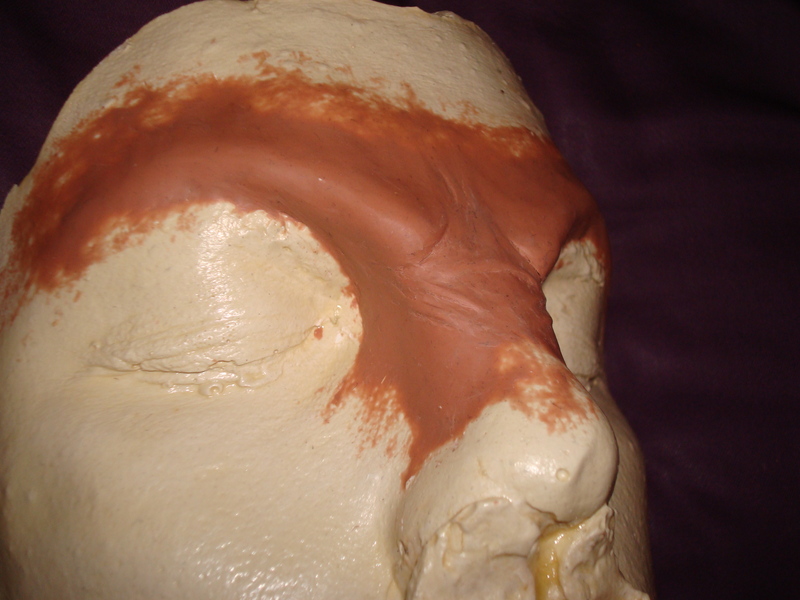 I began by applying the prosthetic with a silicone adhesive and smoothing over any seams. Once that was finished, I painted the whole look with my alcohol activated makeup palettes. First, I layered translucent reds to give the prosthetic a more natural, uneven texture. 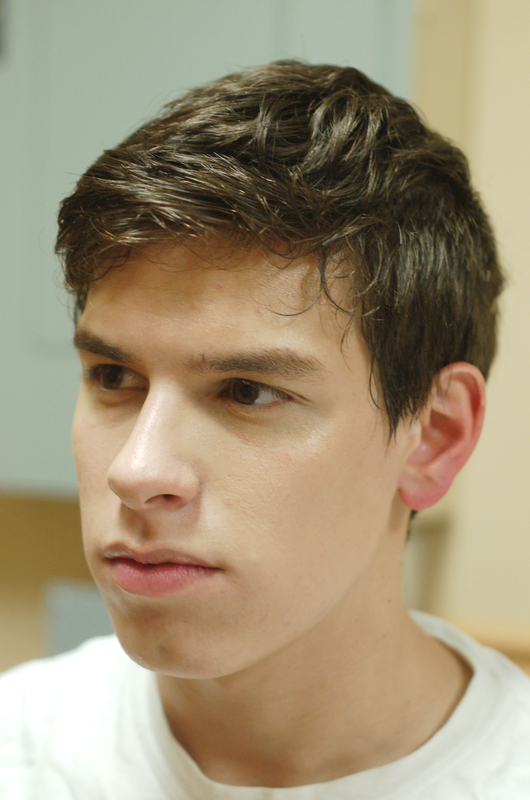 I then used a variety of shades of browns, greys, and fleshtones to emphasize the shape of the look, blend the prosthetic with his face, and masculinize the whole look. I lightly shaded the sides and end of the nose, around and under the brows, under the cheek bones, under the jaw, and under the adam’s apple. I stippled some stubble on the cheeks, neck, chin, and upper lip. I added crepe hair to the ears to give them a furry and pointed silhouette and to the forearms, starting thick at the elbows, and gradually thinned it to the hands (the actor wore a long sleeved shirt with the sleeves pushed up to the elbows). Finally, I added the tooth caps, affixed with denture glue. The whole process took about two hours. 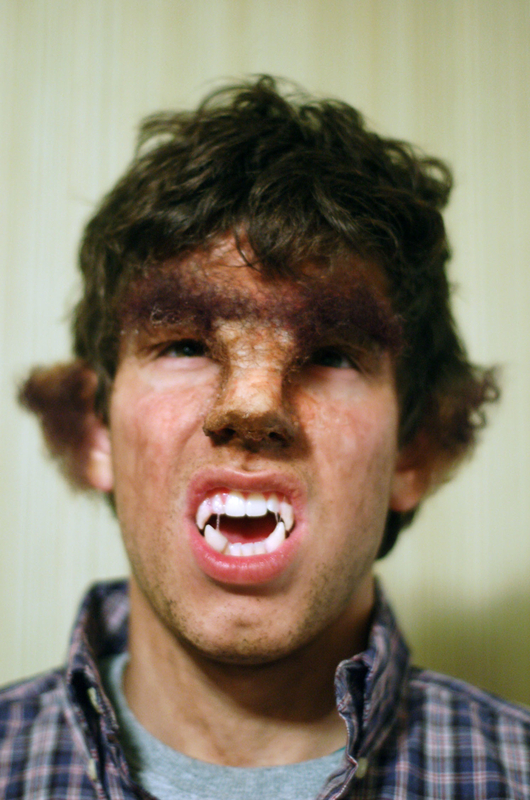 In addition to the werewolf makeup, I did the basic makeup for the other characters and any injury effects. Todd was made up in the style of a handsome leading man, Lily was a pretty and normal college girl, and Alan a normal college guy. For the werewolf bite that Alan has throughout the film, I sculpted the bite in clay, made a mould with liquid plastic, and then cast the piece in silicone. For the dream sequences, I altered Todd’s leading man style look to make him look more afraid and as if he had been running for his life. He was a little paler, had scrapes on his face from tree branches, and was sweating. 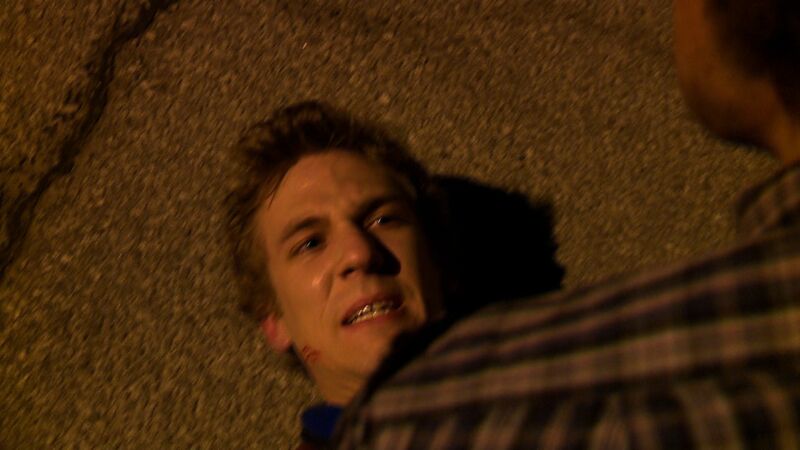 When the werewolf kills him, he bleeds from the throat and mouth. ~ by alanigauntmakeupdesign on April 20, 2010. Oh. My. God. This is freaking impressive. I’m so glad I got to see some of this in progress.